The Raging Kilt | This is why we can't have nice things. In 2010 I walked into my doctor’s office to receive the results of some blood tests that I had drawn the week before. It had been 6 years since my Type II Diabetes diagnosis, most of those years spent in utter denial. I was now 294lbs and feeling understandably bad. Stairs were hard. I used to be a powerful man and I had been reduced to a sluggish fat man who sweat a lot and loved to eat. The doctor sat across the examination room looking down at my results. Her face betrayed nothing of what she felt, she was cold and clinical. The doctor looked up from my results and said to me, “Mr. White, lose weight or you’re going to die”. I was floored. It was like someone had dropped a ton of bricks on me. I was 38 years old, I couldn’t be facing death. This couldn’t be happening to me. The signs were all there though, night sweats and high cholesterol. My triglycerides were over 4,000! The doctor said my triglycerides were so high that they made my cholesterol readings inaccurate. In fact, everything was off the charts. The next day I started walking. At first I just walked a mile and then I started walking the trails through my neighborhood. Next I hit the gym, I started working out at YMCA doing circuits. I had a trainer tracking my progress and slowly but surely the weight started to come off. In time my workouts became routine and I hungered for more and started power lifting. I had dropped down to 252lbs and <20% body fat. My mantra was “I WANT TO LIVE!”. I quickly packed on 20lbs of muscle working out at Metroflex Austin and competed in powerlifting meets. Best thing of all was my blood work came back normal except for slightly elevated A1C from the type II diabetes (that was diet controlled). I wasn’t going to die anymore and I was loving life! As much as I love power lifting I was about to turn 40 and decided that my Army disabilities + my age would make power lifting hard on my joints. I now know that logic doesn’t add up but it motivated me to try the Scottish Highland Games. I went to two practices with Mike Baab and I was hooked. I had thrown discus and shot put in high school so I started to feel that old passion for throwing things again. I competed in the Austin Celtic Festival Highland Games and I was hooked! I even “full body” fouled on heavy weight for distance and felt a little embarrassed but nothing was stopping me from pursuing my new passion. 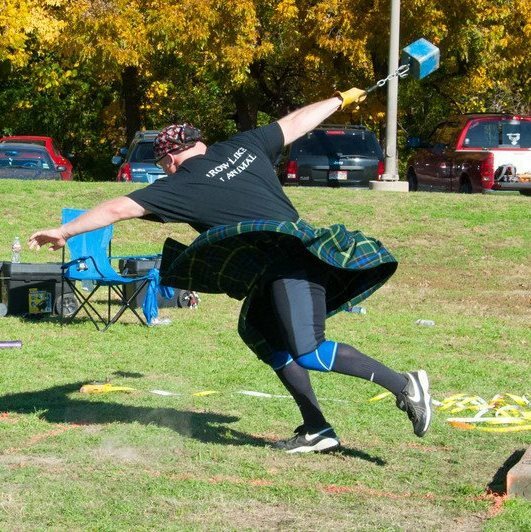 My first season of highland games was a roller coaster of coaching and throwing. I did well. Somehow I managed to place top 4 of every game I went to. I completed my second season and placed 12th at the 2014 Masters World Championship at Inverness Scotland. I took my wife on that trap and we had a wonderful vacation. At the time of writing this I am in the off season for my 3rd season. It has been a decade of health issues and fitness triumphs. A lot of people interpret Dylan Thomas’ poem ‘Do not go gentle into that good night’ a lot of different ways but I took it to heart and gave myself the title “The Raging Kilt”. As a kilted highlander I’m raging against the dying of the light, raging for life itself.